Successfully Added Mini Camera + 2GB Viewscreen DVR (1/3 SONY Super HAD CCD) to your Shopping Cart. Exceptional Hidden Camera (Sony Super HAD CCD) with 2GB Portable Digital Recorder set for making "undercover" videos! Now you can create covert field surveillance videos and review them right on the spot! A great tool for anyone with amateur or professional ing needs. 1/3 inch SONY Super HAD CCD Camera - SONY is one of the most trusted electronic manufacturers on the planet, known for their photo-imaging expertise. Besides the SONY lens, this camera is much better than ordinary CCD cameras because it has a built-in MIC for close up audio and it utilizes proprietary SONY Super HAD technology too! The real world benefits of Super HAD technology is brighter and sharper images even when light conditions are less than ideal. 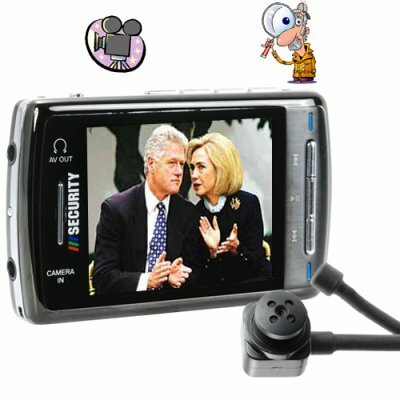 Portable DVR - insert the camera lens attachment into the portable video recorder and you can instantly view and record whatever is happening on its crisp 2.5 inch LCD screen. Use the digital video recorder for private investigation, sports and live events, or evidence collection. It doesn't get any easier! Video footage is recorded to the popular and space saving 3GP format at 30 frames per second with the unit's 2 GB internal memory. And better still, the unit has a micro SD card slot. You can double the memory of the unit and make archive videos to store in your office safe for later use in the courtroom or other venue. Click the "Add to Cart" button right now to order one of these great video cameras for your own work or fun and then order some more as stock for your online shop. Brought to you by the leader in online direct from China wholesale electronics - Chinavasion. 4 hours of continuous video created from this unit takes approximately 2 GB of memory storage space. You can playback 3GP and MP4 videos through the DVR's media player function, but it cannot playback MP3 or other audio files. You can connect the videocamera system to a TV or alternative display to view recorded video footage. What kind of fun can I have with this camcorder? OK here's a good one. Tell your husband that you're pregnant - then record the look on his shocked face! Results were fantastic video quality crystal clear images, a great buy! Sharp camera, simply to use, wonderful screen. Very difficult to find a simila product at this price. Will also play common mp4 files loaded to card or via usb. Camera is a little bulky if you want to hide it under dresses.